Our anti-bullying programs aren’t working. 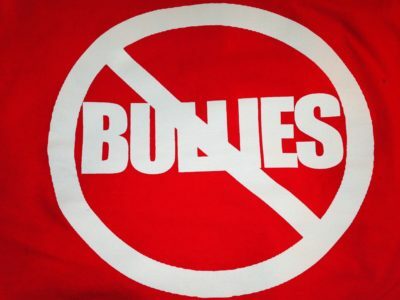 Kids continue to be bullied in school and elsewhere, and ignoring it or walking away often makes it worse. The boys I see in my practice who are bullied tell me, “I just deal with it. There’s nothing anyone can do…” It all happens so quickly. Teachers aren’t seeing it, or pretend to not see it, or they just let it slide if it’s over by the time they do notice. The answer is not important. It’s the question that’s important, and her willingness to stop everything in the room in order to communicate, ‘I saw that, and it’s not cool, and I will hold you to account for it whether you acknowledge your actions or not. I don’t need consensus; I need to speak to the truth in the room.’ The bus driver who hears an ugly remark needs to STOP the bus and get out of his seat and turn to the group of kids who think they’re “all that” and say, “Of all the things you could say to another person, why in God’s name would you say that?” He won’t get an answer but that’s okay. It’s only the question that’s important, and the driver’s unwillingness to pretend he didn’t hear anything, or that it’s not his job to intervene. Because it’s not about it being one’s job or not; it’s about taking the opportunity to let others know that IN YOUR PRESENCE, EVERYONE IS SAFE, and that you will have it no other way, and that you are not willing to avoid an uncomfortable situation for the sake of keeping a false peace. We cannot continue our complacency with current anti-bullying programming that looks great on paper but does nothing for these kids who go to school every day enduring six hours of anxiety about when and where and from whom they can expect their next take-down. Janet Sasson Edgette, Psy.D. is a child psychologist and the author of The Last Boys Picked: Helping Boys Who Don’t Play Sports Survive Bullies and Boyhood.